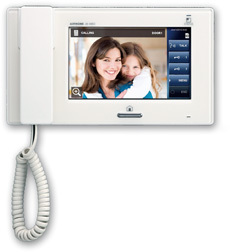 The JM Series features a large 7-inch touchscreen monitor for clear visitor identification and easy operation control. The JM Series can be installed at 4 door locations and connected to 8 inside locations with internal communication between stations. Maximum distance can reach 300m between the door and master station by using JMW-BA adaptor. CCTV is connectable by using JMW-BA adaptor. The GT Series provides building complexes with high performance security & usability. A variety of models adapt to almost any type of building. To provide effective security, the GT series features a wide angle camera that enables you to see an innovative panoramic view! People standing on sides and people of all heights can be easily identified. To see details, switch to Zoom mode. Switching between Wide and Zoom mode can be done by the press of a button. PanTilt is available to change the camera angle in Zoom mode. Works anytime, even during your absence. Records 6 images per picture sequence. Up to 40 pictures sequences can be recorded. Record picture as required. The recording starts when you press the REC button while monitoring or talking to a visitor. The play LED flashes when there are auto-recorded pictures.Press the PLAY button to play. The Master Station with the recording function can be connected with 3 security lines. It can also be connected with an emergency button. When sensing an input from the button, the alarm will be triggered after the set time. The Entrance Station features both audio and visual guidance, so any visitor knows the present situation. The audio guide is available in 6 languages (English, French, German, Spanish, Dutch, and Italian). 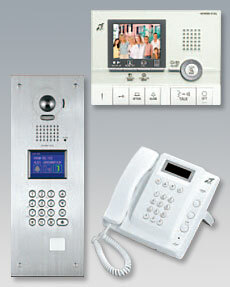 This entry was tagged gt-system, intercom, nem-10a/c, nhx, NURSE CALL, video intercom. Bookmark the permalink.